This story has been corrected to reflect that the Albrights purchased the property after the contamination had been spilled by a previous party. 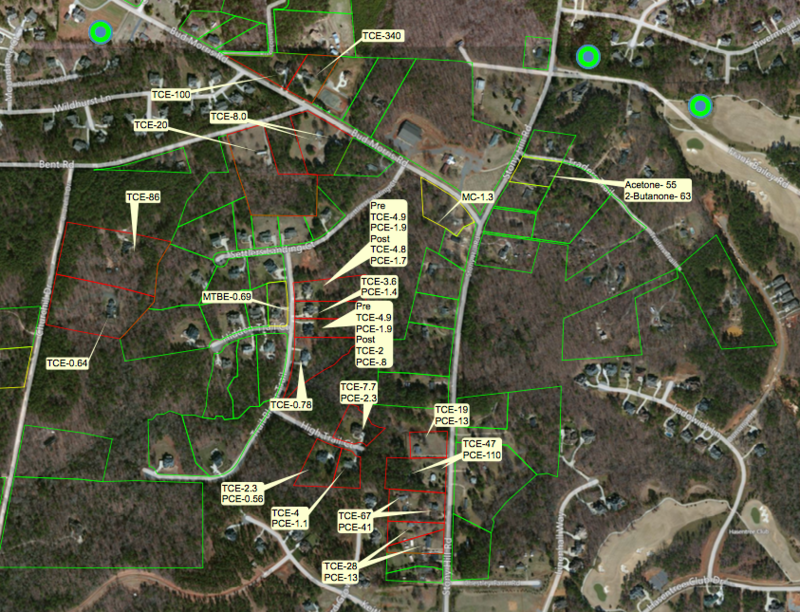 It’s been more than 10 years since 20 households in a Wake Forest subdivision learned their drinking water wells were contaminated with cancer-causing chemicals, TCE and PCE — some at 20 times the maximum contaminant level. Since then, the Environmental Protection Agency, in concert with state environmental officials, has spent $3.7 million to provide bottled water to affected homes in the Stony Hill Road development, to connect some residences to Aqua NC’s community well system and to install whole-house carbon filtration systems in other houses. Yet Donald and Catherine Albright, the settling parties, will pay just $500 for “past and future response actions,” according to an EPA proposed settlement agreement. It’s not unusual for potentially responsible parties to pay a fraction of the cleanup costs. In 2005, a next-door neighbor of the defunct business, who lived at 7305 Stony Hill Road, notified state and Wake County authorities that his well water smelled bad. Subsequent sampling showed high levels of TCE and PCE; the homeowner shut down the well and connected to his neighbor’s. In 2012, DEQ conducted further testing and determined there was a plume of contaminated groundwater beneath parts of the neighborhood. Roughly 20 wells tested above the federal maximum contaminant level of 5 parts per billion for TCE and PCE. Some wells had levels of 110 ppb. Federal and state investigators determined the contamination originated from the old circuit board business, a cinderblock building that had a drain pipe leading to the outside. In performing the additional well testing, the EPA and DEQ discovered a potential second source of contamination that had been previously unknown. That site, on Bud Morris Road, is about a half-mile north of 7303 Stony Hill Road, and was owned by a previous proprietor of the circuit board business. The contamination — only TCE, in this case — appears to be moving through different fractures in bedrock, and is separate from the original polluted area. The public can comment on the settlement agreement through July 24. • U.S. Mail: U.S. Environmental Protection Agency, Superfund Division, Attn: Paula V. Painter, 61 Forsyth Street SW., Atlanta, Georgia 30303.